Thank you if you’ve stuck with me through this. A bit more variety will be coming to the blog soon. But there’s been variety in these posts, albeit firmly within the sphere of classical music. And I hope they have given at least a dim impression of the magnificence of Hyperion Records. For my last choice, I had to pick one of the marvellous series of discs to come out of Westminster Abbey in recent years. 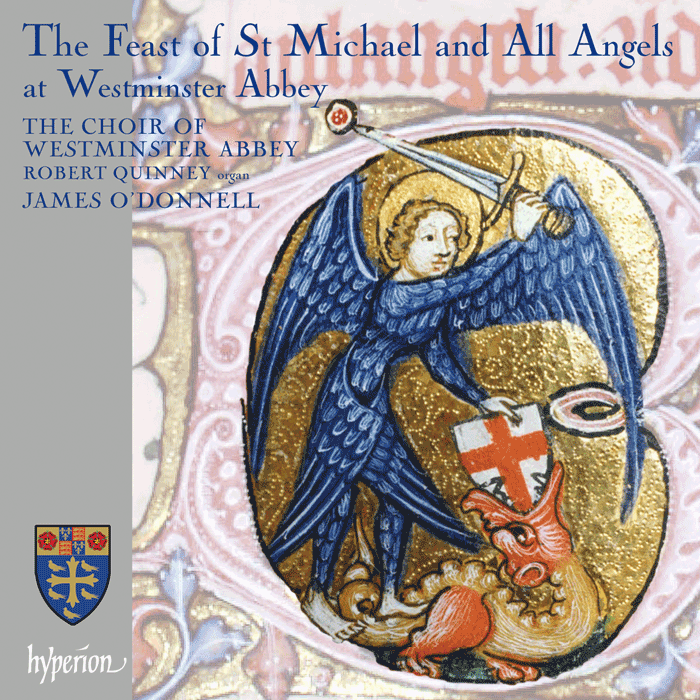 They have released a number of superb recordings of music relating to particular seasons or feasts of the liturgical year, and I have chosen the one for Michaelmas, which happens to fall this coming Wednesday. The strength of this series lies as much in the astute selection of repertoire as it does in the performances. The structure of each programme covers three services – Matins, Eucharist and Evensong. This allows a broad selection of motets and anthems, canticles, preces and responses, Psalms, a Mass setting, and an organ voluntary. It’s a superb concept. I can’t cover everything in detail, but will write a few things about this particular programme. It opens with Richard Dering’s radiant Factum est silentium, though that is the only music here dating from before the late nineteenth century. The responses, familiar but never hackneyed, are those by Kenneth Leighton, a composer of whom I am particularly fond. Though of course I don’t remember it, I gather I met him when I was a few months old, he having been one of my parents’ lecturers at Edinburgh. Mrs Leighton kindly gave me a small wooden car as a present, though I do not play with it as often as I ought to. The two Psalm chants are among the most lovable in the repertoire: Stanford for Psalm 148 and Alcock for Psalm 91; and the ‘Jubilate’ for the Matins service is the popular Britten setting in C, which receives the breezy, ringing-toned performance it demands. The centrepiece of the CD is Jean Langlais’ magnificent, imposing Messe Solennelle, which really allows the choir and organist Robert Quinney to shine. It’s a great example of a piece written in a modern idiom (though its harmonic language draws on the medieval) that is nevertheless fairly ‘user-friendly’ to those who believe themselves immune to post-1945 classical music, and judging by this performance it must be a joy to sing, if not a walk in the park. The music for Evensong features pieces commissioned by George Guest for the 450th anniversary of the foundation of St John’s College, Cambridge in 1961. The music of Sir Michael Tippett can be forbidding, but in the motet Plebs Angelica and his evening canticles for John’s, he shows himself to be a sensitive (if in some respects severe) composer of liturgical music. The ‘Nunc dimittis’ from his service is particularly beautiful, and beautifully sung by a quartet of soloists led by the uncannily pure-voiced Nicholas Trapp. Much more than just a curiosity from a man who rarely wrote church music. Herbert Howells, by contrast, wrote his best music for the church. His Sequence for St Michael is one of a handful of pieces that poignantly invoke the memory of his son Michael, who died suddenly in 1935 at the age of nine. It is a great pleasure to lose oneself in the richly chromatic writing of this moving tribute. If I have one regret about the series it is that no hymns are included, and I feel their absence particularly keenly on this disc, where Howells’ tune ‘Michael’ (‘All my hope on God is founded’) would have been a fitting and self-recommending choice. Jonathan Harvey’s arresting Laus Deo is the giddying and fitting final voluntary. As luck would have it, here’s a rather nice video of the hymn from Westminster Abbey. I can’t quite date it, but given some of the hair on show (particularly on the lady in blue) I’d be surprised if it was much later than 1990.